The Restek Cyano is a traditional monomeric cyanopropylsilane that is recommended for assays where alternate selectivity, or confirmation, to a C18 or C8 column is desired. It can be used in normal-phase, reversed-phase (best with mobiles phase pH between 5 and 7), and HILIC modes. 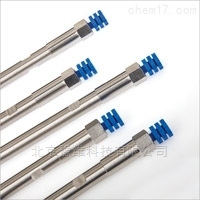 It is an excellent choice for the analysis of protonated bases. 953631E 3 μm 100 mm 3.0 mm ea. 953636E 3 μm 150 mm 3.0 mm ea. 9536315 3 μm 100 mm 4.6 mm ea. 9536365 3 μm 150 mm 4.6 mm ea. 953651E 5 μm 100 mm 3.0 mm ea. 953656E 5 μm 150 mm 3.0 mm ea. 953657E 5 μm 250 mm 3.0 mm ea. 9536515 5 μm 100 mm 4.6 mm ea. 9536565 5 μm 150 mm 4.6 mm ea. 9536575 5 μm 250 mm 4.6 mm ea.